There will be an excursion to the Huntington Library and Gardens at 12:30pm on Sept. 21. Attendees should meet at the Beckman Institute Auditorium at 12:30pm on Sept 21, walk to the Huntington, have lunch there (see below), and meet for a walking tour at 2:30pm. 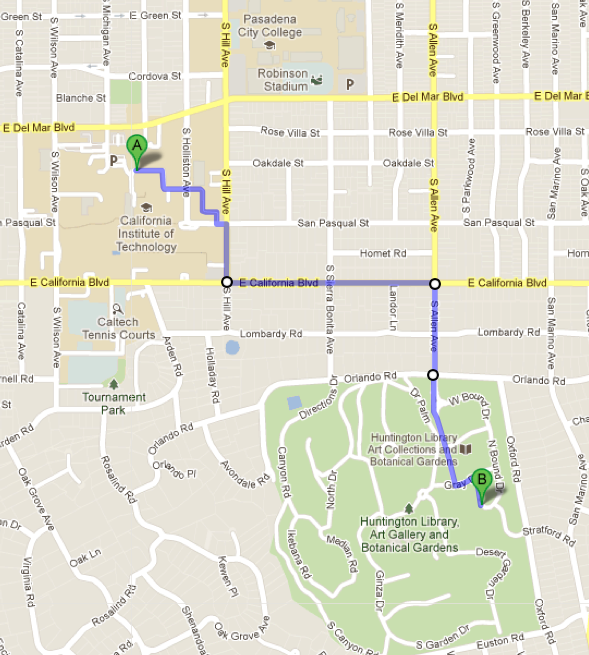 From the Beckman Institute Auditorium, walk to the south-east corner of the Caltech campus at California Blvd and Hill Ave. Head east on California, turn right on Allen. Walk south on Allen for 2 blocks to enter the Huntington, continuing for 5mins until you meet a T junction, turn left, then right to enter the main entrance (which has a ticket office and bookshop). At the gate give your name and show your name badge. Map to find lunch and tour location (building number 29 on the map in your packet, and building 27 on the following pdf: Huntington map). Attendees should go for lunch at one of the places in the gardens. There are three choices here. For convenience of location and reasonable price, we recommend the cafe. The Tea Rooms are also conveniently located beside the cafe, and a wonderful experience, but usually require a reservation: to make a reservation click here or call 626-683-8131. There is also the very nice Chinese Garden Tea Shop, but this is a 10-15 minute walk, so it might be better to go there after the tour if you want to sit and chat. You may also bring a packed lunch to eat in the gardens. The tour begins at 2:30pm. The meeting point for the walking tour is under the shade of the trees at the cafe outdoor seating area (building 27 on the official Huntington map). We will split into groups of 10 to 15 people for a one-hour guided walking tour provided by one of the many volunteer "docents" at the Huntington. You are free to stay in the gardens until they close at 4:30pm. The bookshop stays open until 5:00pm. Be back at the conference location at 8:00pm for panel discussions.